If you’d like to take advantage of the benefits of a TRIG membership, with perks such as vendor discounts, incredible networking opportunities, real estate investing education, private investing forum, TRIG classified ads, TRIG Facebook group, and more, you can join right here. TRIG’s corporate membership includes 4 member slots, which can be shared among a larger group of employees who can take turns attending events. 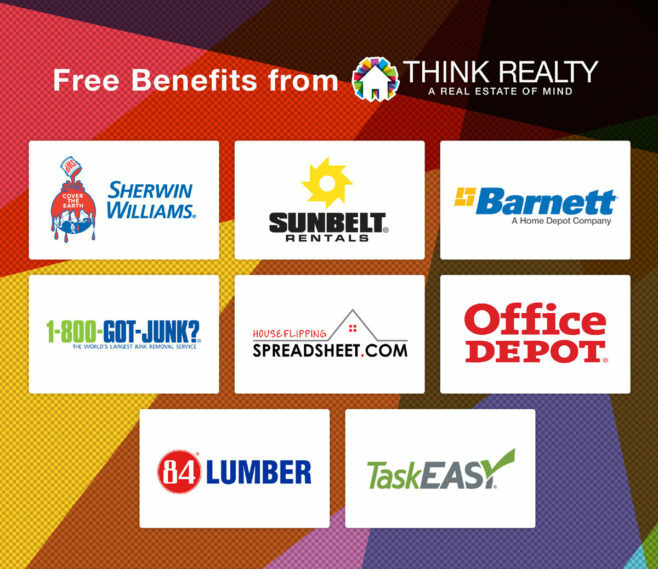 As a member of TRIG you are eligible for a complimentary membership in THINK REALTY. This will entitle you to discounts at from number of national companies. Ask for special pricing for Trig Members. Obtain FULL credit report & background/criminal/employment checks without requiring FCRA compliance b/c Applicant orders & pays for it. MSR is launching nationwide and so is currently offering the referral program but expects to phase it out later. Organizations that join now will always keep the referral. Investor’s Title & LT Caplan, P.C. $100 off closings! Close with an attorney for peace of mind! Discount: Contractor pricing on flooring and cabinetry.